We were able to find and organize the MKF source files and put them up for public download. Please note Game Maker 8.0 or 8.1 is required to open the GMK file if you want to edit it without any conversions from the GMK format. You can open this file in Game Maker Studio 1 or Studio 2, but you will be doing a lot of converting of functions from GM 8.x that are not supported in Studio 1 or Studio 2. We will not provide any support to the public regarding how to use the source files. MKF Source files, music not included (154MB) – Includes the GMK file that opens in Game Maker, DLL files for music playing, and all non-music external files such as background images and sprite sheets. MKF music files (162MB, 111MB) – These music files come split into two compressed archive files, the first being 162MB in size and the second 111MB. Make a folder named /Music (the ‘M’ is capitalized) in the main MKF folder and extract everything to that folder. Is it possible to run this on a raspberry pi? No. The software used to make the game runs on Windows-only PCs. Therefore, the games made by the software only runs on Windows PCs. On a Raspberry Pi running Windows 10 IoT Core, it is even much less likely the game will run on that platform because MKF does not run on regular Windows 10 PCs due to the software having problems running on PCs running versions of Windows later than Windows 7. Actually, you probably can! I’ve never used one myself, but as long as you’re able to use Wine and grab the necessary DLLs, it should work. And it should work for Game Maker 8 or older games. -Get a working version of Wine + Winetricks. -Basic configuration. Start winetricks, select the option to use its prefix. -Install DLLs. DirectX9 (winetricks will recommend a specific version of it) and Directsound (dsound, required for playing .wav files) should be enough. -Go to winecfg. In the Library tab, edit the dsound dll so it uses the internal version instead of native. A MUST, otherwise expect an enormous delay when playing audio. Pulseaudio (Audio tab) seems to work perfectly, otherwise use winetricks settings to change the audio device. -Start MKF using the game’s executable. It will likely throw an error that sounds might not play; this is due to using the internal dsound library instead of the native one. Don’t worry, it works! Bear in mind it might not run at full speed; MKF was already quite heavy for a Game Maker game, with tens of thousands of assets and lots of memory required. In Game Maker 8 or 8.1, in the menu bar, go to the File menu and select Advanced Mode if you are in Simple Mode. 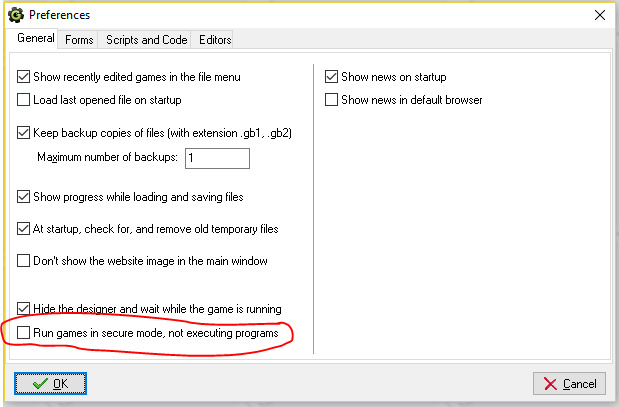 Once in Advanced Mode, go to File > Preferences… and in the Preferences dialog window’s General tab, clear the check box for the option “Run games in secure mode, not executing programs” at or near the bottom of the dialog window. It may look slightly different in GM 8.1, but accessing this option is the same in both 8.0 and 8.1.